Two years ago – almost to the day – we reviewed the Thrustmaster T300 RS for the PS4, PS3 and PC. 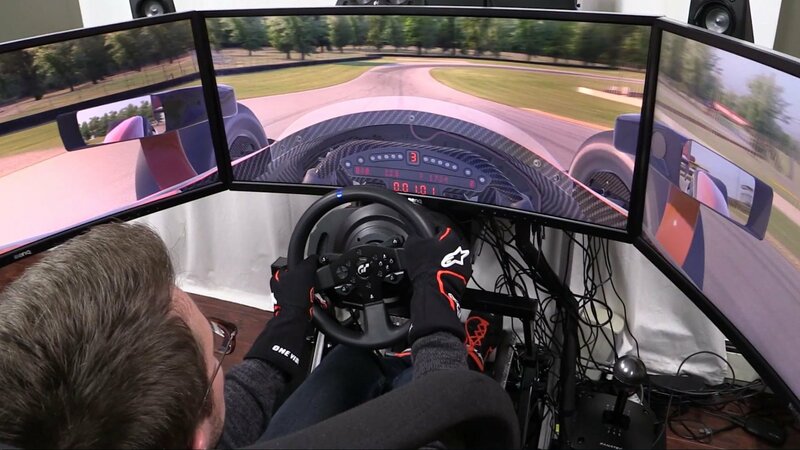 Since that time, the T300 has not only become one of the go-to wheels in sim racing but has become the center point of a fair sized Thrustmaster eco-system. 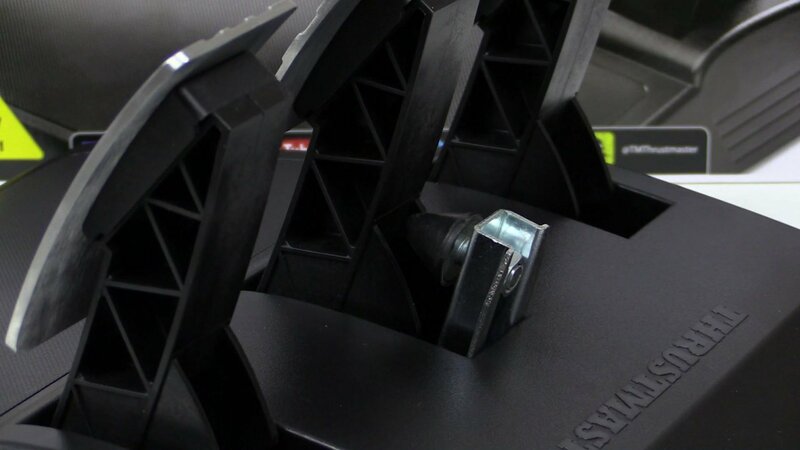 That eco-system includes derivatives such as the T300 Servo, which is just the stand-alone wheel base, and the T300 Alcantara Edition that features the fantastic feeling 599 Evo Alcantara rim and removes the not-great 2-pedal set in lieu of the solid T3PA 3-pedal set. And now there is a new addition to the T300 family, the T300 GT Edition. The GT Edition, named after the Gran Turismo franchise and featuring GT Sport inspired box art, throws it’s hat into the ring with….minor changes. Should you spring for the T300 GT Edition? Let’s talk about it. So if you already bought the T300 RS and upgraded to the T3PA pedals, there’s nothing new to see here…thanks for watching, and make sure you click the “Like” button before you go! But if you are in the market for a new wheel and pedal set, stay with me, because the T300 GT Edition offers a nice price/performance argument. The GT Edition comes in at $399.99, the same price that the T300 RS was released at two years ago. Today, the T300 RS goes for about $350. That means for only $50 more, you upgrade to the much better T3PA pedal set. Frankly, it’s a no brainer at that price. What’s so special about the T3PA pedals, and specifically, this version of them? First off, the T3PA are a solid set of pedals that will allow you to race competitively. Are they the best pedals out there? No, but they allow you to race competitively. The driving I did for this review reminded me what a solid set of pedals the T3PA’s are. The conical brake mode does a good job of adding resistance to the brake pedal and the gas pedal has good snap-back. And what about those pedal faces? 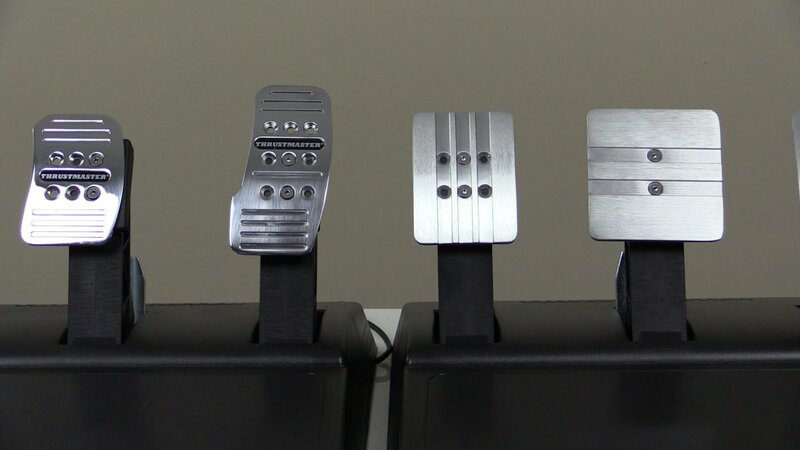 Visually, the new pedal faces are a nice upgrade from the standard T3PA faces, with clean lines and brushed aluminum. They are also bigger in width, height and thickness, which is nice from not just a “higher looking quality” standpoint but from a practical standpoint. I liked the feel of having a little more pedal under my foot. What I was a little disappointed by, was the lack of options for the brake face’s location. While the gas and clutch pedals keep the same mounting hole options as the standard T3PA pedal set, for some reason, the brake loses four of it’s holes. This means I wasn’t able to move the brake face more to the left as I like to do to straighten out my left leg. With that said, due to the gained width, the GT Edition’s brake pedal face reaches about the same location as the pedal face of the standard T3PA when you utilize the leftmost holes, so there really isn’t much difference. Regardless, I would had like to see the brake mounting options from the T3PA make there way over to the GT Edition pedals. As for the wheel, there isn’t a whole lot to say. It’s the same T300 that I’ve had on my rig for awhile now thanks to its good force feedback strength and smooth, consistent, belt drive. It can be hard-mounted via two M6 bolts – which are not included and I wish ALL wheel manufactures would throw them in so your first stop after getting the wheel isn’t to the hardware store – and a table mount that does a good job as long as the table is uniform thickness. The GT Edition allowed me to reacquaint myself with the base T300 rim – and like the pedals – remind me that it’s a pretty good base rim. 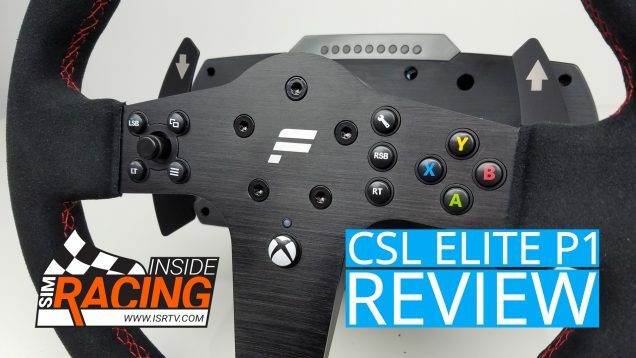 While not wrapped in leather or Alcantara, it is wrapped in nice feeling rubber that isn’t too hard or too soft and has positive feeling buttons and shift paddles. Is the T300 GT Edition revolutionary? No. Is it a fruitless branding exercise? I don’t think so either. 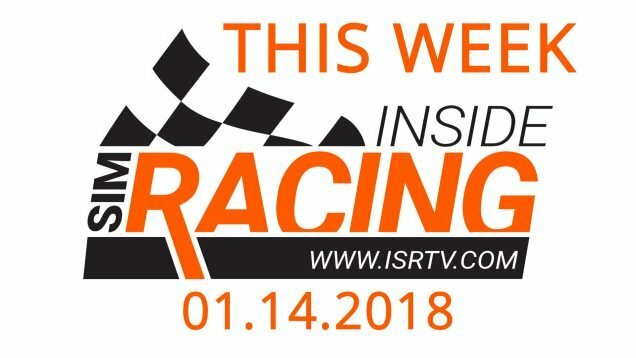 While the GT Edition doesn’t move the needle for anyone already with a T300 or T500 or TX – if you’re a PC only racer – it does give people looking to get into sim racing, or upgrade their experience, a new and well priced option. $400 for a T300 wheel and flashier T3PA pedals is a good deal. In fact, the hardest decision may be whether or not to spend an additional $70 and upgrade to the T300 Alcantara Edition for $470. Sure, you don’t get the new pedal faces but you do get that sweet 599 rim. Options are a good thing. Well, usually a good thing, with exceptions being picking out paint colors with your significant other, or picking out flooring, or lights… Sorry, maybe that reference just applies to me. 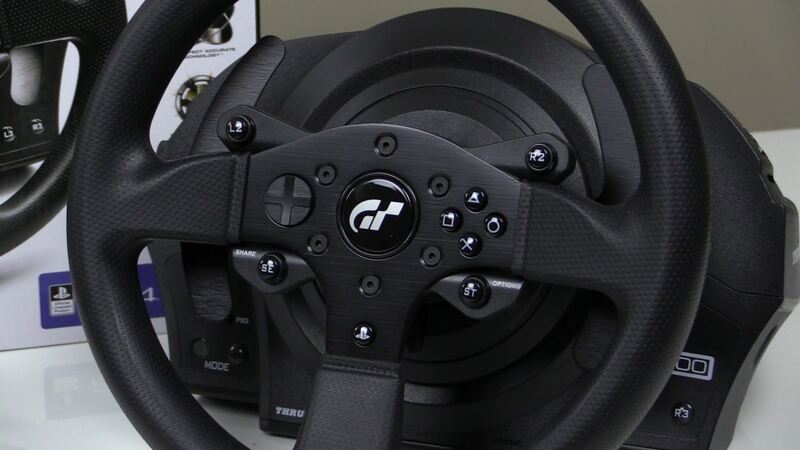 But considering the not-that-many-choices of wheels and pedal sets out there in sim racing, having another is indeed a good thing, and that’s what the T300 GT Edition offers.